I have suffered from chronic fatigue for some time now. Whole body cryotherapy significantly boosts my energy levels so that I can be productive throughout the day! 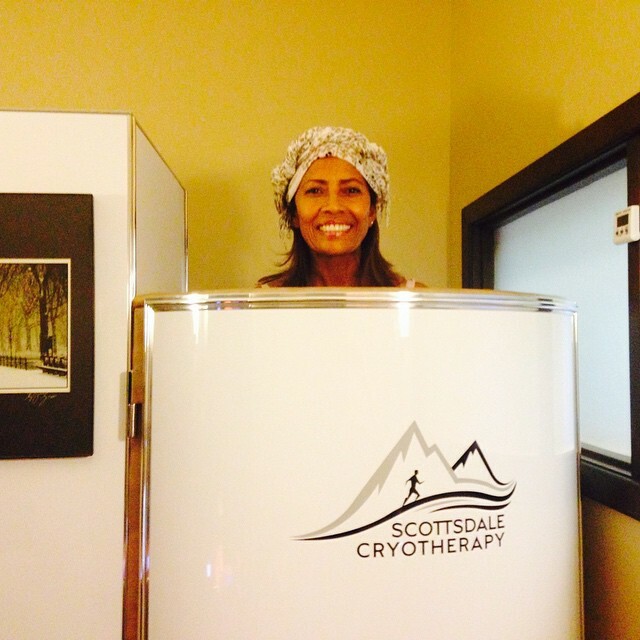 I can’t say enough great things about Scottsdale Cryotherapy. I have suffered with arthritis in my lower back for 3 years. I’ve used all sorts of treatments from yoga and swimming to ointments with varying degrees of success. About 3 months ago my back got so bad that nothing worked to relieve the pain at all. I’ve been reading about cryotherapy for a couple of years and I wasn’t so sure it would work. But after 3 years battling this and 3 months of constant pain I finally decided to give it a try. I felt great after just 1 treatment. But the big wow came when I went to bed…..no pain, no tossing and turning trying to find a position that didn’t hurt too bad. All the years I spent in pain. I am so glad I finally tried it. Greater flexibility, no pain….and best of all hope. I am 64 and with this young age the body is telling me it needs help. Recently I have visited my son in Scottsdale AZ. He mentioned the Cryotherapy. Said it be something I would like. I am always hot, so he thought this be right up my alley. This was the first time I ever heard of this type of treatment. As usual when one hears of something for the first time like I did I had a hard time to believe and it sounded kind of scary. But, I thought what the heck I’ll try it. So I did. WOW!!!! It was amazing. Did it three times before leaving AZ. So now I want to do it again and again. I have, had knee pain. Gone. Trouble sleeping. Slept like a baby. I was happy. I have more energy. Absolutely LOVE IT!!! If anyone out there has the means to do it, DO IT, I live in Kansas and there’s no place here yet. I want to get on the plain and go do it. I have a swimming pool, so for a while, before the hot weather, I would go in the cold water. It felt good, but not like the cryotherapy. The best thing I ever did. I am the biggest septic. So it has to be really good for me to love it so much. My athletes recover after a hard interval workout back-to-back with a hard lifting session, and feel great when they are normally wiped out! They feel like they can go work out again! I had a knee replacement 4 weeks ago and decided to try whole body cryotherapy while doing my regular therapy sessions. I had one treatment and had my usual therapy session the next day. My therapists were absolutely blown away by my ability to perform exercises that are utilized about 6 weeks following surgery. I have continued treatments and the results get better and better! 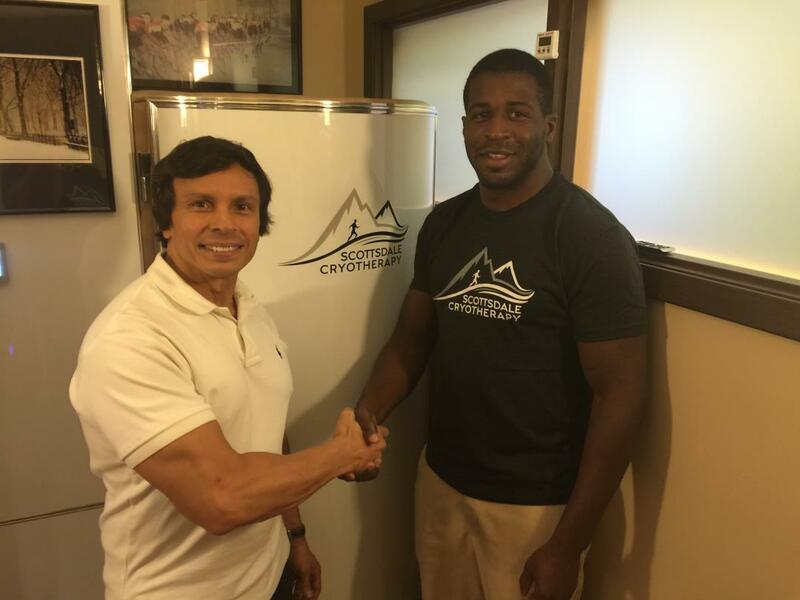 Angelo is great and very knowledgeable about cryotherapy. He has been doing the cold training since 1983. Would recommend him to everybody! I started cryotherapy 9 wks post-op from a total knee replacement. Not knowing what to expect I was pleasantly surprised when it helped with the pain. Also, really helped take down the inflammation. Angelo is very knowledgeable and made the whole experience fun. I started with the intention to only do one but ended up buying a series of ten! Great place to go if you are active and working out regularly and do not want the impact to your body to slow you down. Cryotherapy is also good for any injuries and has allowed me to push forward into full weight-bearing cardio without the after affect of sore and swelling knees. Angelo is an expert and customizes to your needs. Super great customer service. I had heard different things about cryotherapy and all the benefits but didn't understand how freezing yourself for 2 minutes really would do anything! However I have rheumatoid arthritis & I was willing to try anything at this point! I was having more inflammation than normal in my elbows and knees and heard that Scottsdale cryotherapy did whole body and local therapy to help reduce inflammation! I went to my first session and was instantly hooked! They are so great there and make the processes so easy and comfortable! I first did the whole body treatment where you step in the machine dancing around for 2 minutes while it gets colder by the seconds then switched to local treatment directed strictly at my elbows! I have now gone 3 times and leave feeling less inflamed each times and better yet have more range of motion in my elbows releasing the stiffness. This treatment helps body aches, swelling, inflammation, injury from work out or sports etc! I highly recommend this if you want to get your body back to feel 100%. Putting the cryotherapy aside And just based on experience, customer service and quality of my time spent there this is the place to go. On top of that the cryotherapy is instant relief for tension, pain and stress. Angelo has a lot of passion for this and helping in keeping your body energized and helping it recover. I have always been a big believer in cold therapy for relief of pain and for faster recovery from any type of injuries. Scottsdale cryotherapy takes that to a whole new level. Every time I leave I feel so energized and ready to tackle the world. Angelo is a one of a kind therapist and is amazing at pinpointing the problem areas. If you are looking for relief from stress, pain, or ongoing injuries Scottsdale cryo is going to be a game changing experience! WOW... What an incredibly and exhilarating experience. I thought it was going to be an uncomfortable treatment, but it wasn't.. I felt so great afterwards, full of energy, invigorated and instantly out of pain... I highly recommend this to anyone, wanting to improve their health, well-being, energy and ease of pain. The service and staff are great and very knowledgeable! I'm extremely pleased how I feel after just two sessions of Cryotherapy. Angelo is excellent and I am looking forward to how I'm going to feel after my upcoming sessions. This place is great! 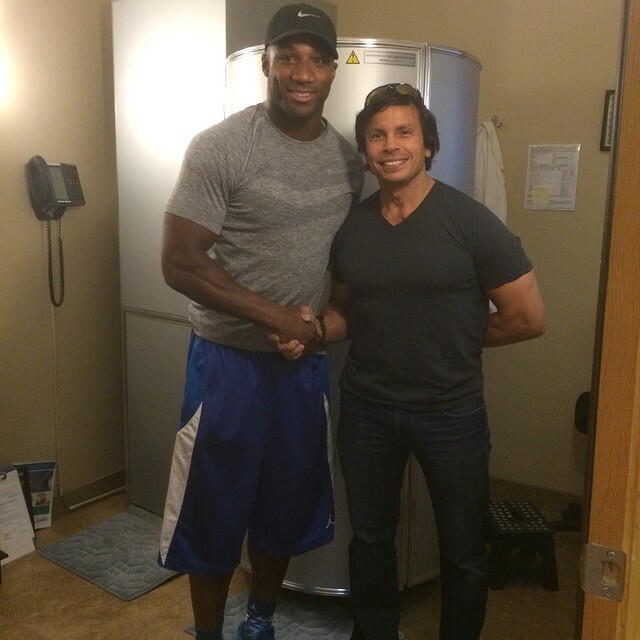 I have been seeing great results by doing the cryotherapy sessions combined with a healthy holistic lifestyle. Plus, both Valerie and Angelo are super awesome and its so easy to schedule appointments online. Just finished my 3rd session and can feel less inflammation all over, especially my knees. Won't be needing Cortisone shots after finding natural help! Angelo is so knowledgeable and shares information, but wants you to do your homework and not just take his word! Can't wait to see how much better my body continues to feel with more weekly treatments! 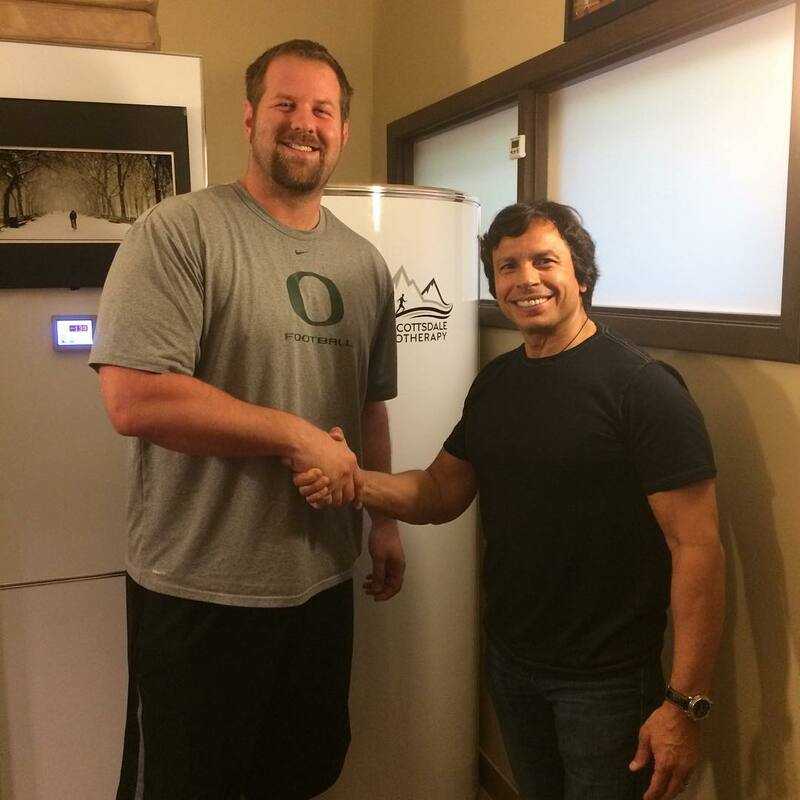 So grateful to have found Angelo and Scottsdale Cryotherapy! Aside from helping with my inflammation in my knees, my bunion pain has diminished. Angelou got me using cold laser therapy prior to my cryotherapy treatment and in just 2 cold laser therapy sessions and just finished my 5th cryotherapy session; I have not had any pain. Angelou is extremely knowledgeable and willing to help you as much as he can. It is great to hear him remind me that along with the cryotherapy I must eat better and take better care of my body! Shows how much he cares about people! So happy to be healing and working with such a caring person! Angelo is the bomb!! He treated my sore legs from running while I was in town. He gave such wonderful advice about changing my eating habits and going to a more Paleo diet too. Thanks for fitting me in and helping me lose calories! Just started doing cryotherapy a week ago and it's great! Angelo is such a great guy and makes you feel right home in the chamber. I've had a nagging knee injury for a while and coming here has really helped me recover. They not only did cryo on me, but also cold laser which was great! 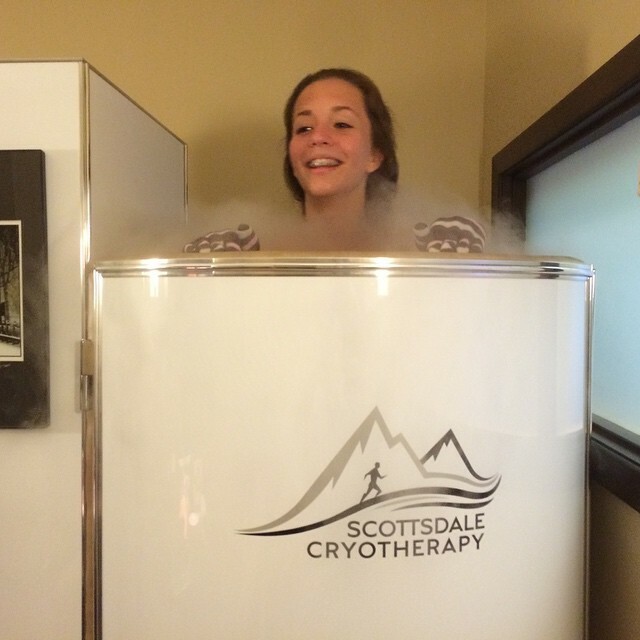 I definitely recommend Scottsdale Cryotherapy to any athlete looking to recover from injuries. Angelo is a great guy. He is informative and knows what he's doing. I'm a young athlete who goes to Angelo to release inflammation and recover faster. There is no other cryotherapy I would go to. I had reconstructive knee surgery about a year ago that has been in serious rehab, as well as some lower back pain. Prior to my first cryotherapy treatment, I had no idea what to expect or if it would even work. Other than the obvious fact that it is COLD, I couldn't believe what an amazing experience it was. The benefits blew my mind; my lower back pain is gone, my knee is less stiff, my mind is clearer, I have more energy. All this from one treatment. This is not even mentioning how amazing and informative Angelo and the office staff are. The office is relaxing, professional, and inviting. Angelo is extremely knowledgeable, and obviously passionate about his clients. I can not recommend him and this team enough. I can't wait to go "freeze" again! Omgooooodness as soon as I walk in the building I felt a very warm welcoming from Angelo. His synergy is amazing and so pleasant to be around. I had one treatment done and immediately I felt energize. I walk in not knowing what to expect because I'm actually in perfect health but more so concern for using the therapy for my recover runs. The experience was very nice, very clean environment absolutely loved Angelo. Highly recommend scottsdale cryotherapy. I had my first ever cryotherapy session on Monday and while I was a little nervous entering the building, once I met Angelo, I felt totally at ease. He was supreme in all aspects. I thought I had done my research before hand but learned a thousand times more about the benefits of Cryotherapy. After stepping into the Freezer: ...Angelo's calm, encouraging, focused attention and totally cool and awesome atmosphere and just an all around amazing energy about him, made me feel totally at ease as the degrees decreased. When i completed my first session- stepping out : I was immediately astound by how giddy and happy I felt and all the areas in my body that previously had been hampering my everyday activity felt great. For many hours after the session I was happier, donning a huge smile and feeling inside and outside all around amazing. That night I slept better then I have in more then a decade! Today(5/6) was my second session : and again it was totally awesome/incredible and while reaching ever lower Temps then my first session I never had a moment of discomfort...Angelo has an amazing passion and mastery of all the effective modalities for treating countless conditions and the benefits of cryotherapy helping people of all ages, levels of health, etc...My initial reasons for going were to relieve muscle and joint stress/pain and as incredible as I've felt since the first session I've notice numerous other aspects be it mind, body, inside, outside, that it's like I've been going through a total reboot of my system and without getting anymore winded: I FEEL BETTER TODAY then i I have in last 15 YEARS!!!! Thank you!!! Thank you!!! Looking forward to another session next week and the continued transformation/rebooting/enhancing literally all facets of my life!! !it truly is A COOL PATH TO HEALTH! ANGELO I forever THANK YOU!! !